Thomas Piketty: … It’s not only economists’ fault. Historians and sociologists are too often are leaving the study of economic issues to economists. Sometimes nobody does it. This is a really important point. We need not only economic analysis of history (e.g. economic history), but a better understanding of the history of economics as a discipline. John Mueller makes this point quite well in Redeeming Economics. Thomas Piketty: In a way, wealth is a deeper issue because wealth is the accumulation of past income. But it’s more than that. You also have inheritance. You also have natural resources, which can be part of wealth that was not saved by anyone or not wealth of the previous generation. It’s an object that encompasses income, but that is broader and also that is in a way a better indicator of total inequality, lifetime inequality. It’s more permanent than income. Income has inherent limits as a measure of economic inequality, and is not of itself a good proxy. So wealth is in some ways better and more comprehensive. But it has its limits as well, in part because it isn’t a foolproof proxy for human capital. Thomas Piketty: … my point is not at all to destroy wealth. My point is to increase wealth mobility and to increase access to wealth. The fact that we have a very high wealth‑to‑income ratio is good news…. When I talk about the progressive wealth tax, I’m not thinking of increasing the total tax burden. Think of the US right now where you have the property tax, which is a lot of money. That’s a very big tax. It is far easier to reduce inequality by destroying wealth or inhibiting its creation than it is by other means. The likelihood of introducing a new tax scheme to replace the current system without increasing overall tax burden seems…unlikely. Thomas Piketty: … the market value of a corporation and its social value can be two different things. Of course you don’t want the market value to be zero, but the example of the German corporation shows that even though their market value is not huge, in the end they produce some of the best cars in the world. There are, of course, such things as non-profit corporations and other forms of association that don’t have any readily identifiable market value and yet have great social value. So this is an important distinction that often gets overlooked by both the political class as well as economists. Thomas Piketty: Inflation has proved to be very useful to reduce the large stocks of public debts that we had in the 20th century. Now the progressive wealth tax, in a way, is the same thing as inflation, but this is sort of a civilized form of inflation. It’s like inflation, but you can make sure that people with limited wealth would not be hurt, and people with billions would pay more. With inflation you have chaos, in that you don’t actually know who’s going to pay for it. Very often, not only do you destroy the public debt, but you also destroy the savings accounts of lower and middle class people. I think this is why Europe today, for instance, has a very hard time with inflation. That’s why I think tax on private wealth or property tax on private wealth is a better way to go than inflation. Now, if we don’t have the tax, inflation is better than austerity. If you only have budget surpluses to reduce a public debt of 100 percent GDP with zero inflation, which is what we have in the Euro zone right now, it can take decades and decades. Inflating your way out of debt is a form of default, as James Buchanan has observed, and is thus a form of theft, as the scholastics also rightly noted. Thomas Piketty: It was a view in the 19th century that democracy could flourish better in America (or at least in white America) than Europe, in part because you had a more equal distribution of wealth in America. This is something Tocqueville was very impressed by when he visited America. There are lots of factors which are not primarily economic that have impacts for economic inequality, and until social analysts come to grips with this, the debates about economic inequality will remain superficial and distorted. 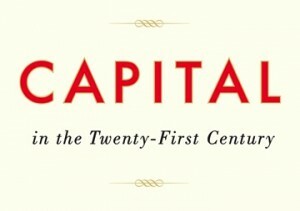 From this interview at least, Piketty’s treatment of “capital” in the 21st century seems far preferable to its 19th century counterpart. What Matters Most for Social Mobility?